I designed Biki for use in my class notes and animation demonstrations, and this jaunty walk cycle dates from that time (between 1992 and 1995). I decided to put it here to represent the free spirit that is at the heart of hand-drawn animation. On November 18th 1928 the moviegoing public met Mickey Mouse for the first time. 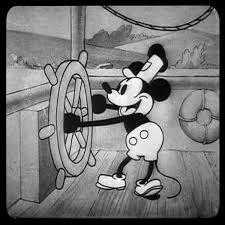 The film, Steamboat Willie, is considered the first animated film with synchronized sound. And the mouse has become, for all intents and purposes, the symbol of the art of hand-drawn animation. In the frustrating days when CG was driving hand-drawn animation into a corner, we thought of introducing a special day to celebrate that endangered art form which had, after all, given the world so many masterpieces over the century. At the time there was a distinct effort to force the hand-drawn technique into obsolescence by persuading public opinion that CG had superseded it. Even the celebrated Walt Disney company betrayed its heritage and disbanded the select crew that had created some of the best loved films over decades. 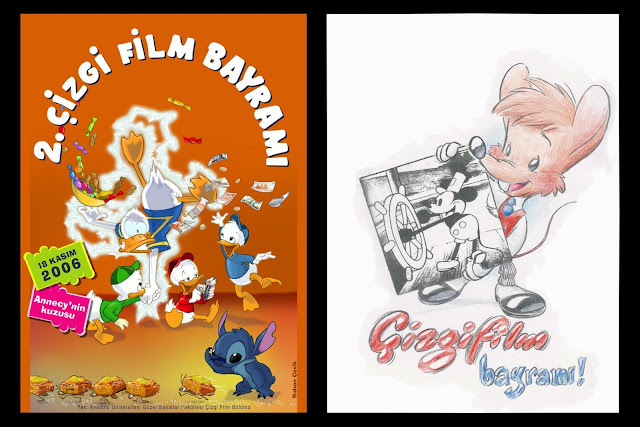 Rıdvan Çevik organized the first Day for Hand-Drawn Animation at Anadolu University in Eskişehir on November 18th 2005, and next year, in 2006, I was organizing a parallel celebration at Maltepe University, Istanbul. 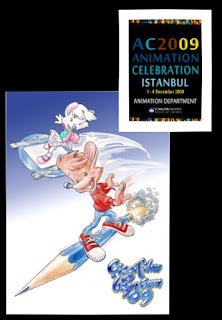 "Hand-Drawn Animation Day" celebrations in tandem in 2006; left, poster by Rıdvan Çevik for the activities at the Anadolu University in Eskişehir, and right, my flyer for the activities at the Maltepe University in Istanbul. The students responded well to "Hand-Drawn Animation Day" and our friends who were working professionally lent enthusiastic support. It felt as if we were on to something. However the administrations of the schools were less than supportive. In 2009, Maltepe turned the event into something to encompass all techniques, called it "Animation Celebration", and moved the date (to 1-4 December). Lâle and I nevertheless celebrated on the day, and our friends from the professional world came in a demonstration of solidarity. with the date set for two weeks later. Then last year (2014) friends from home and abroad sent messages congratulating my "Hand-Drawn Animation Day", I even got someeven from friends from outside the animation world. I was genuinely touched. We got together at the home of our friends, Erhan and Leyla Gezen, joined by Murat and Ceylan Çelik. 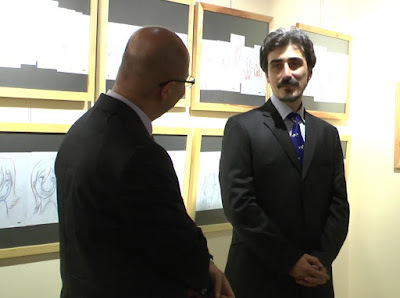 Erhan and Murat showed their "teacher" their recent work, which made me proud, like my life had been worthwhile after all. (For Erhan see: http://erhangezen-animator.blogspot.com.tr, for Murat see: muratcelik's videos on Vimeo.) Leyla fixed that pleasant show-and-tell session on a photo. I have suffered since then the loss of James ("Jim") Macaulay, my teacher at Sheridan College passed away. I had been corresponding with him and his passing has made the world a bit lonelier. 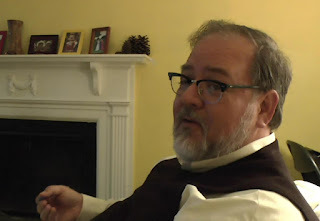 (See: "James Macaulay", 7 April 2015.) It was, however, an occasion to reestablish contact with some schoolmates, and even graduates I had not personally met. in Istanbul in June 2015. 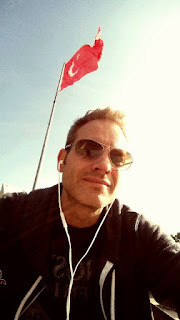 In September who showed up but colorful Nurten İz? This remarkable lady had entered Turkey's nascent advertising sector purely because of her love for the Disney films, and worked for years in trace and paint. We hadn't seen each other for 28 years! It was a very nice visit. 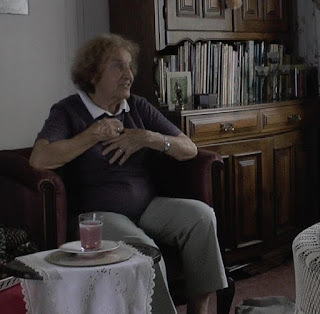 No one would believe she is an octagenarian; her unaging vitality rejuvenated us. Rıdvan Çevik, our friend and colleague (and one-time intern at Esin Desen), invited us to the opening of an exhibition of his animation drawings at the "Museum of Caricature" in Eskişehir. The theme of the exhibition was "Caricature of Motion", connecting well with the identity of the museum. His animation drawings on display in a cultural surrounding and a screen showing them in motion constituted a fine effort towards gaining respectibility for our Art. (For Rıdvan's work see: çevikçizgifilmci.blogspot.com.) So we drove there and that was another pleasant reunion. 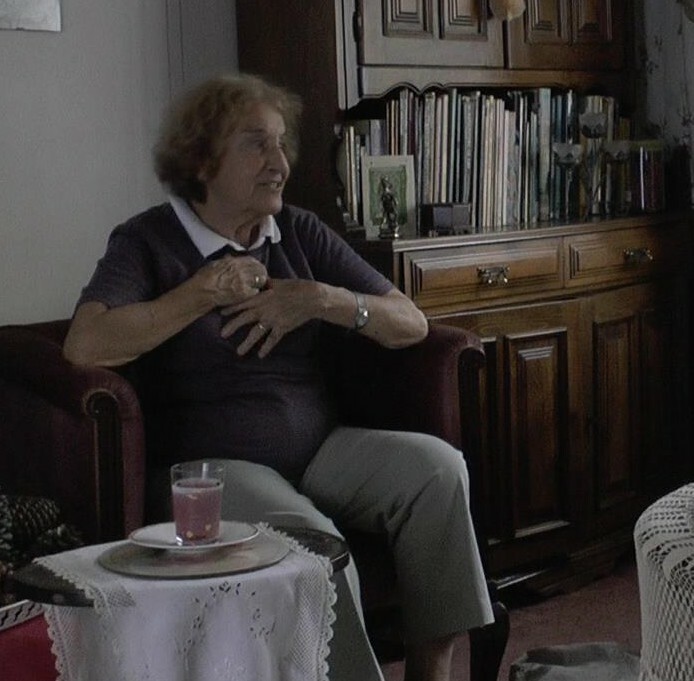 Merve (right) with Lâle, holding samples of her work on her lap. Some family business took us to the US and I used the forced trip as an occasion to see another old friend- David Nethery, my schoolmate from my days as an animation student at Sheridan College. We had a looooong chat, being understandably reluctant to part after such a long time- 33 years to be exact. Being in the US right now, and being just north of Florida, we will just have to visit Walt Disney World. We have a trip planned for the coming weekend- just four days after Hand-Drawn Animation Day! Very appropiate! So now it's time for us to wish all our friends a happy and cheerful Hand-Drawn Animation Day. Watch something hand-drawn today! If you don't have time to dig out anything else, just watch this latest work of master animator Glen Keane produced in 2015. And remember why it was always such a special experience!